FLOWPICK robotic machines from Siléane are able to manage random flows, as well as fresh and fragile products. They can sort, calibrate, handle, and pack all sorts of products with unpredictable behaviour at high speeds, largely thanks to VRT (Vision, Robot, Tracking) technology. Powerful software for balancing and monitoring flows manages the multi-robot configurations. At the heart of things, the FLOWPICK VRT (Vision, Robot, Tracking) core makes it possible to adapt the robot trajectories in real time and in a closed loop arrangement to any random product behaviour and product flow speeds sometimes in excess of 50 m/min. These robotized lines created by Siléane can therefore adapt to all kinds of industries (food processing, glassware, pharmaceuticals, recycling, automotive, etc.) and a wide range of products (fruit, chocolates, cheeses, containers, trays, sachets, etc.). 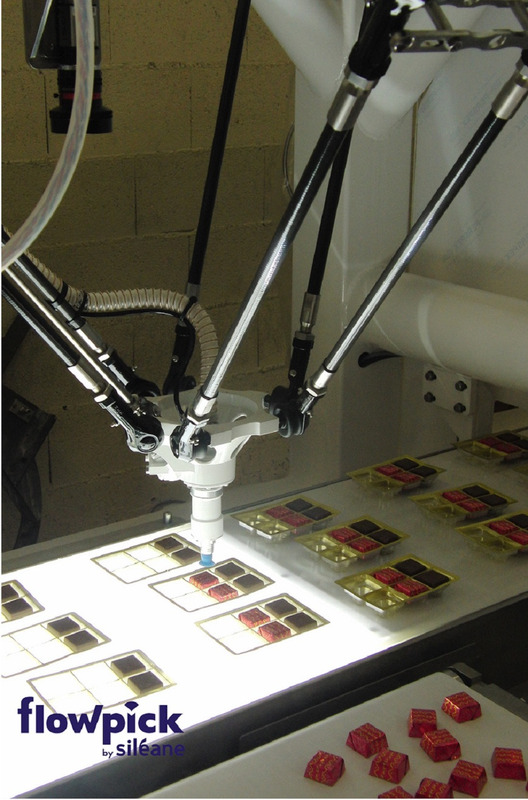 For these applications, Siléane uses its FLOWPICK range of adaptive machines to deal with picking, fixed-weight matching, assembly, packing, boxing, loading, unloading machines, sorting, control, etc. With a proven track record in terms of reliability and return on investment, they can give your processing and packaging lines a real shot in the arm.